First off all I had to get my hands on some new gear so I hit up Chris Sharland from Manic with a a little email explaining what I was gonna be getting up to... 15 days non-fishing specific trip through New South Wales in Australia with my girlfriend, but this time I would like to bring some fly fishing gear with me :-) I made the biggest mistake last year when we headed to Cook Islands and thought that there won`t be time for fishing because I wanted to enjoy the time away with my girlfriend, even though Chris Dore (and my girlfriend) told me to take the gear and have a little flick on the beach while she enjoys cocktails at the bar... I was like NAH MATE I will be alright. Big mistake!... Since then I have brought my rod on every vacation :-) !! Our trip took us 2937 kms driving through New South Wales and I tried to wet the line most evenings or early mornings in all the different places we stayed. I knew it`s going to be quite challenging as I had no previous salt water experience and minimum research done. First couple of days were basically spent running up and down the beach trying to spot a fish and blind fishing a few estuaries but with no luck whatsoever. But I took it more as trying to learn different casting techniques, and practising double hauling with heavier equipment then normally.. I had my hands on a Scott Tidal #8 paired with Lamson Speedster and Airflo FlatMaster fly line, and as It was my first ever saltwater combo to fish with I have nothing to compare it with. But as an owner of a freshwater Scott Radian my expectations were quite high. It can take some time on the water to get good at handling your rod at different fishing scenarios, but with freshwater experience and Scott Tidal in hand, it was much easier to get things done. This #8 weight lightweight combo opened a whole new level of casting ability to me, especially when double hauling. Casting out heavier and bigger flies with easy load and able to land them to the places I wanted was just a pure joy! Of course a couple end up getting snagged on the branches overhanging the estuary banks but in general I was amazed by the accuracy of the rod. 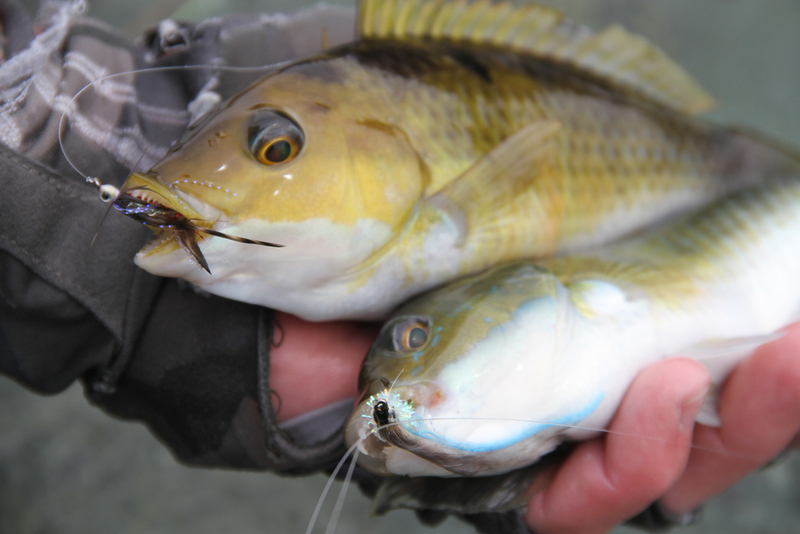 Scott Tidal is good value for money and should satisfy a beginner or experienced angler. One evening I finally came across some bigger size fish, which were more then just a couple of curious fly followers and my first Australian Salmon (kahawai) was hooked. The first fish came out of nowhere.. what followed was an erupted take with the fish quickly disappearing into the deep. The fish made a solid bend into the rod, but was landed after couple of minutes... Unfortunately that was the only Kahawai as all the others broke off just seconds after hook up. But with our next destination in sight, I knew I was heading back to my natural habitat as we headed onwards to Jindabyne in the Snowy Mountains, to visit great friends and explore some of Australia's best freshwater fishing. The Thredbo river, one of the most beautiful trout rivers I had ever fished. Amazingly peaceful place to spent some time around, with plenty of easy access. The tranquil water of Thredbo river is surrounded by beautiful sub-alpine flora and that ever present smell of eucalyptus. Fly fishing this river reminded me of many years ago when I was a kid, catching very high numbers of fish on my local river in Czech Republic.. It does not happen too often that you rock into a spot pretty late in a day and catch more fish in 15 minutes then you have fingers on both hands. Knees deep water and trout willing to rise to dry fly on every occasion. This is definitely a place that I will be returning to! Hold on a second..... Summer has not truly arrived yet and looking at the long term weather forecast, it does not seem to be coming anytime soon! Temperature hardly getting over 16 degrees celsius, rain, clouds and of course the always present wind from all directions. It`s been tough lately but in the end, it`s all about being out there enjoying yourself. New places were explored over the past month, old rivers revisited , some fish caught, some fish lost, many just spooked but we also came across our first TROPHY brown trout! Christmas day was one of the warmer days so we decided to jump on our bikes and peddle to a local remote lake. Fish were very active as rising water temperature brought out swarms of damselflies and dragonflies. 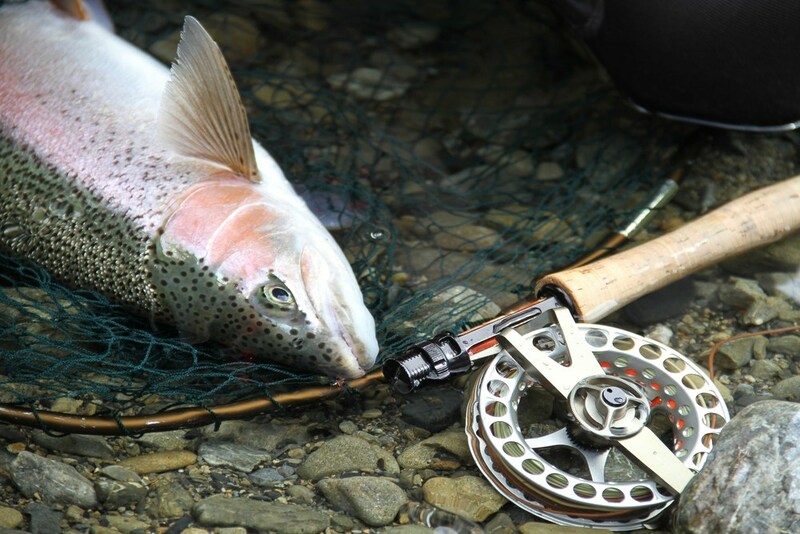 Browns and rainbows smashing streamers all day as soon as they touch the water... I say YES! DORE`S MISTER GLISTER got chased a lot! But the best thing about this trip was that we explored absolutely new place to us, which ended up being a sweet surprise! Willow grubs...some people hate them but some people love them! Great fun on a little stream full of fish snacking hard on these little guys! Over two months have passed since our Opening trip and that is also about the same time it has been since I have seen Chris......! 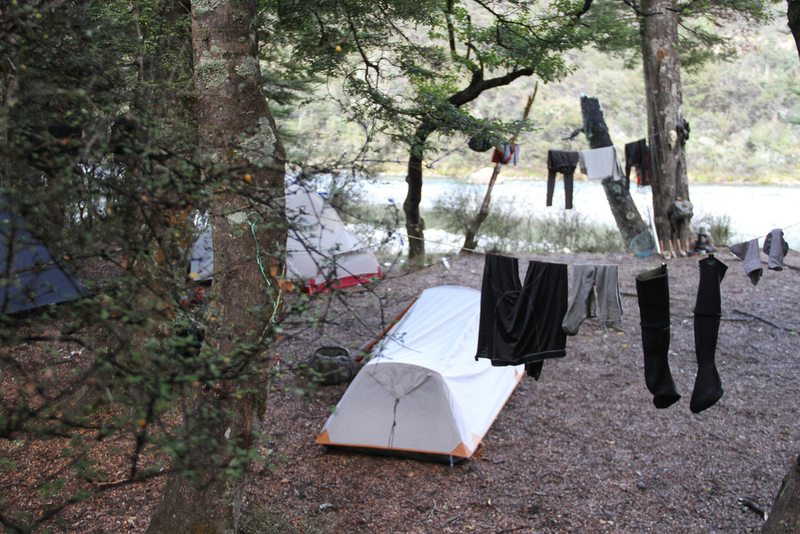 It`s been the same way every year as he moves out of town for half the year to manage the Glade house Lodge deep in Fiordland, but of course from time to time he gets out and we try to make the most of it. Today was the day and we had a blast! But let`s have a look first what were we up to last month.. Most of my days off - Rain, Rain, Rain!...and when it finally got nice out, some kind of stomach bug totally messed me up and the trip was over. But over the weeks we still managed to get out a few times and catch some fish! The right selection of fly is crucial on this creek. It`s Monday and it's supposed to be a really warm day, or at least according to the forecast. We arrive at the spot and as usual for us, there is noone else there. we whip up a quick breakfast, rig up and head towards the river. Within the first couple minutes the first fish is in the net, and every pool and hideaway we fish from there on in, continues to delight us with the goods. Today all flies and techniques seemed to work in our favour, and even though it was just a single day of fishing, it was a fruitful one. The forecast did not lie either. By the end of the day, my bare legs show the true power of the New Zealand sun! Maybe next time I catch up with Chris it will be in his territory. Stay tuned. Dawn till Dusk Opening trip! Before we say anything about the trip we need to say THANK YOU to our friend and personal bush mechanic DEVAN KIRKER! Cheers for all the hard work and your company! GOOD TIMES! DAY BY DAY story of our OPENING TRIP followed by PHOTOGRAPHY! Happy season everyone! Sunny with no wind and definitely some good fish in the river. A quick recon the day before revealed that there were more fish than the previous year. With the Hut to ourselves and no other fisherman around, we knew we were pretty lucky. After two quick re-rigs the first fish was hooked and lost but it was a good sign as it was feeding like crazy. Walking amongst the high tussock mountains following the meandering river, we were hopeful, but we never expected to see that many fish, let alone catch them. Just a perfect start of the season. Expecting the weather to change we headed out of the mountains to fish a big rolling river, but we should not have worried too much because it ended up being a warm and still day in the foothills. Even-though the fish were hard to spot, a well placed fly brought rainbows and browns to the net. 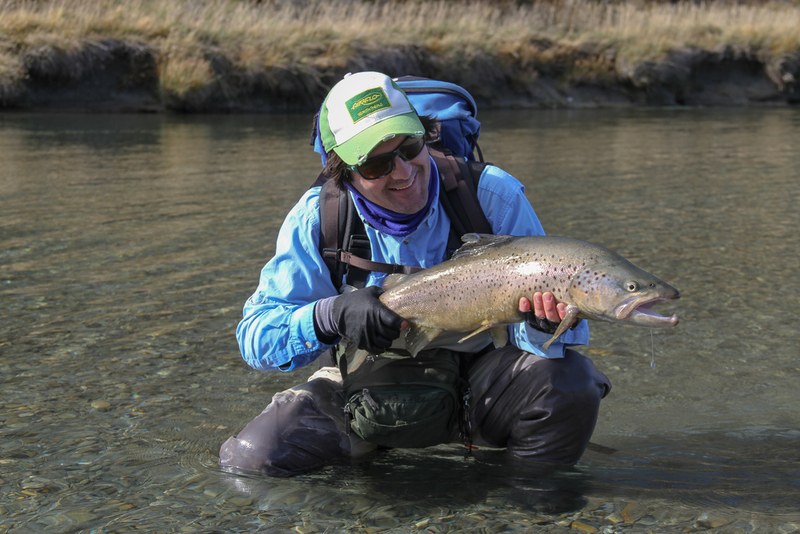 A spinner fall later in day saw fish rising and some dry fly action was an unexpected delight. Watching the morning Fiordland clouds quickly move on over breakfast, we knew we had no time to waste so we hurried down to the river. 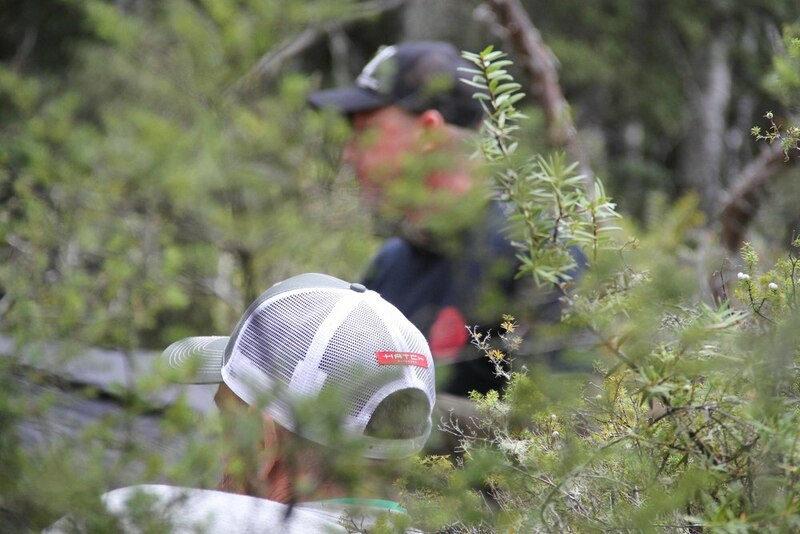 There is never any guaranties but when we saw there were no other fisherman around....I gave Chris a HIGH FIVE and we legged it through beautiful Fiordland beech forest to an amazing and challenging river. I fished this river a few times and thought I knew a thing or two about catching these big spooky trout, but by the end of a long 11 hr session, I had only landed one, whilst Chris bagged 3. My confidence was taking a bit of battering not helped by Chris pointing out he had caught twice as many fish as me by the end of day 3!!! !...By consolation, all my fish thus far had been caught on the first cast. Topping up on gas in town and picking up a key to a locked gate was the plan of the morning. Always the optimist, I was expecting a good day one this lovely river, but I can only describe today's fishing as sensational! Big fat browns all in superb condition. After landing 4 fish I felt in the zone and clawed back the lead Chris had on me, but with two fish from a beautiful run, he was back in a game. The next couple hours we both landed a few more fish and just felt good for each other. 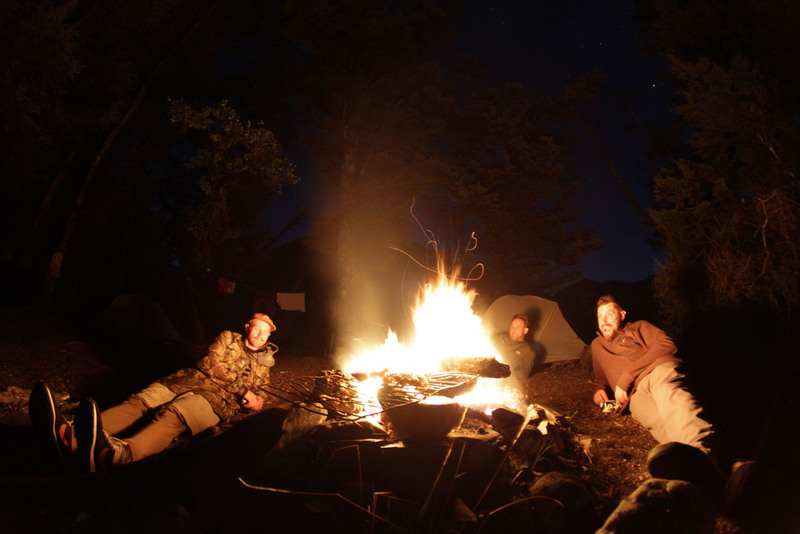 Being at the hut with the fire going, whiskey in hand, two thoughts came to mind, we can`t wait until tomorrow and damn this whiskey tastes fine. Waking up deep in the backcountry we did not have to worry about a thing. Hot beans on toast and cup of coffee got us going but really it was the prospect of another fantastic day that saw us make a beeline to the river. We only visit this little stream once a year early in the season and every time we are surprised to find the a fish in a same place and this year was no exception. Catching them though always proves a challenge. We usually spot about 6 fish the whole day, but it`s not really just about the fishing. It`s a beautiful place, gin clear river, awesome hut in the middle of nowhere, the fishing just makes it the perfect destination. It`s 5 am. and Chris is already running around as he is in charge of getting us to the river which I have never fished before. We knew it`s a popular place so we wanted to be there by sun up. Getting to our destination it looked like it was going to be a hard day with cloud cover and low light, but within an 1/2 hour the sun broke through the clouds and we started to spot the big browns that this river is well known for. What followed Chris and myself may have dreamt of, but rarely experienced in reality...the fishing was red hot. Catching 1 or two fish in this river is considered a good day, but we somehow managed to pull out 9. All prime condition browns averaging 7 pounds. An hour walk saw us in the backcountry and fishing amongst the tussock fringed with beech forest and mountains towering in every direction. It was another sunny day with no wind and plenty of big browns!!! Just when we though the fishing could not get any better today proved us thankfully wrong. We've fished 100's of days, had 100's of epic adventures, but this day on the river rates as my all time most memorable day. Just prefect, I won't try to describe it!!! With sore feet, sore knees but clear minds we head home a day early, completely satisfied. As we wanted to do something different, here is a little interview followed by photography with my fishing buddy Christopher Hrycyk. What`s your favourite piece of outdoor kit? My Scott Radian and Lamson Speedster. Love them!!! What`s your most expensive piece of kit? 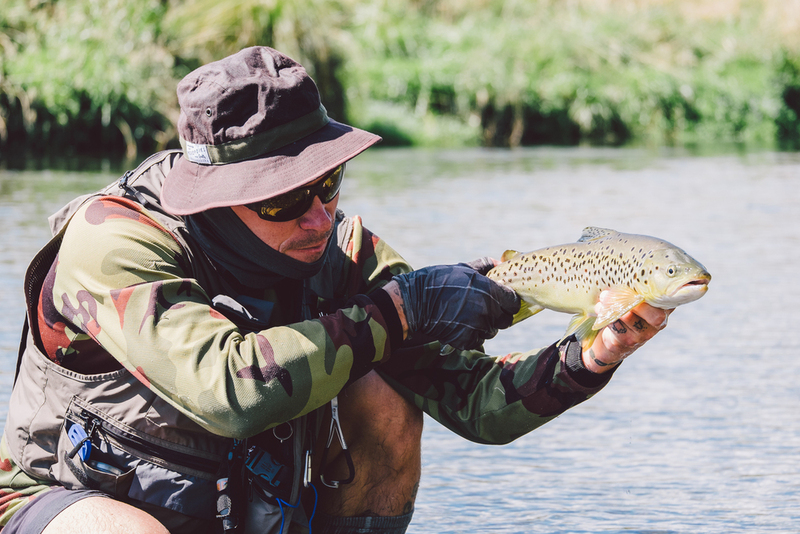 What does the fly fishing mean to you? What`s your favourite place to escape into outdoors? Somewhere quiet. That could be backcountry, frontcountry, stream, lake, estuary or beach...as long as there is fish and no-one else around!!! 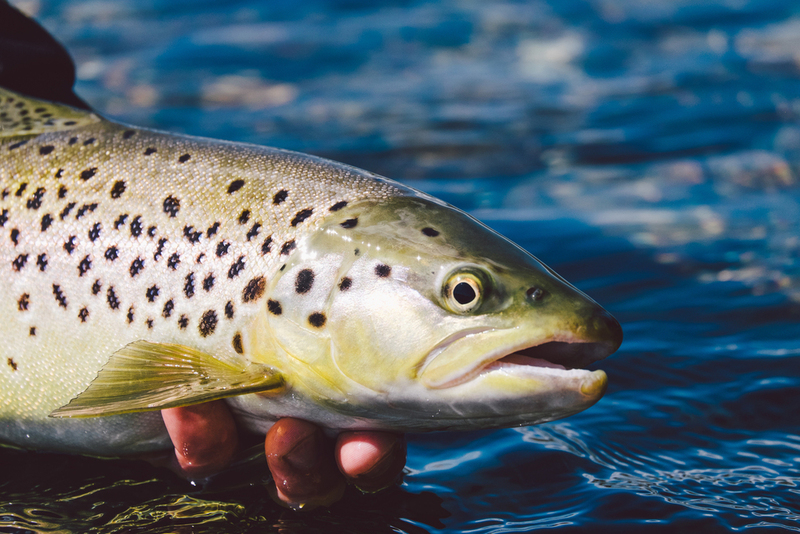 What is your top fly fishing tip? I think people tend to take flyfishing too seriously, so i'd say "don't take flyfishing too seriously". It's important to remember what got us into it in the beginning. For me it's hanging with mates, spending time in great places, the journey, the destination and of course catching fish!!! Do you prefer day trips or overnight trips? If not fishing on your own who would you most like to go for a fish with? I've got some great fishing buddies and a few brothers that I love to fish with. 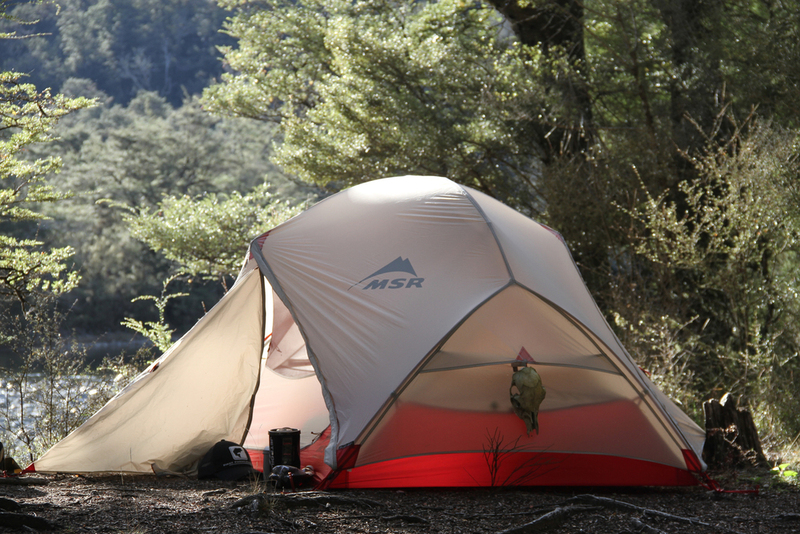 What do you pack for overnight backcountry trip? The Scott Radian and Lamson, spare rod, the essential tackle etc, a spare set of dry clothes, raincoat, down jacket, sleeping bag, tent (if not staying in a hut), torch, first aid kit, good food, coffee, gas stove and gas, my billy, 3L of water, whiskey, tobacco, toothbrush and toothpaste and earplugs for my mates...because I snore!!! What do you call backcountry? In essence I think it's a place you have to hike in to...however thereare a lot of places serviced by rough roads in stunning locations that I'dalso class as backcountry. What makes or breaks it for me is the solitude...if anglers gave each other a wide birth we'd all be better for it. Describe the most scary moment you`ve had when being backcountry? What is your highest number of days fly fishing in the row? What`s your favourite after-trip tipple? What is your top outdoor tip? 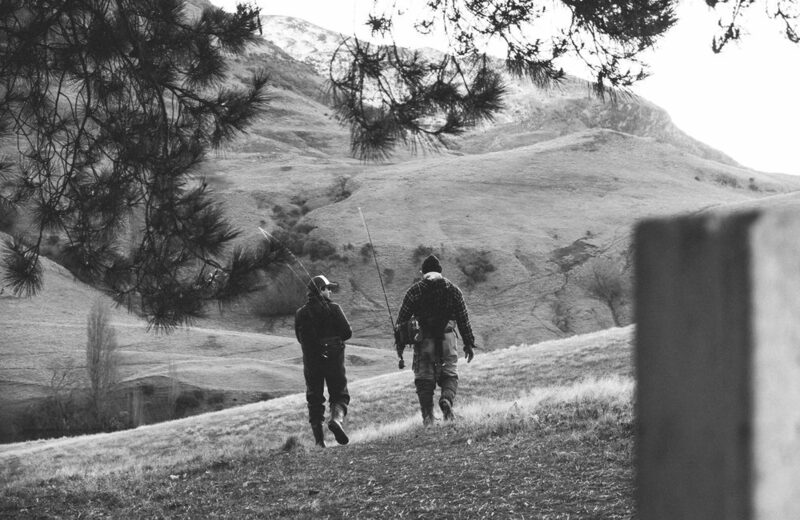 Two fly fishing adventures you`d put on your bucket list? Highlight of the 2015/2016 season? Opening Week...Good company, so many rivers, awesome huts, great fishing and the promise of an awesome Summer!!! Last weeks plan was a bit more unusual then it would normally be. My friend Jason decided to move back to Queenstown from Auckland, which brought the idea of me flying up and sharing the drive. I guess we just wanted to call it a road trip! We had three days to chew through this 1685 km long drive which includes the ferry between two islands. We of course wanted to fly fish and enjoy any other outdoor activity. We found ourself looking back on this trip feeling very fortunate for the experience! Given that photos say more then I can, here is a photo recap of our trip! 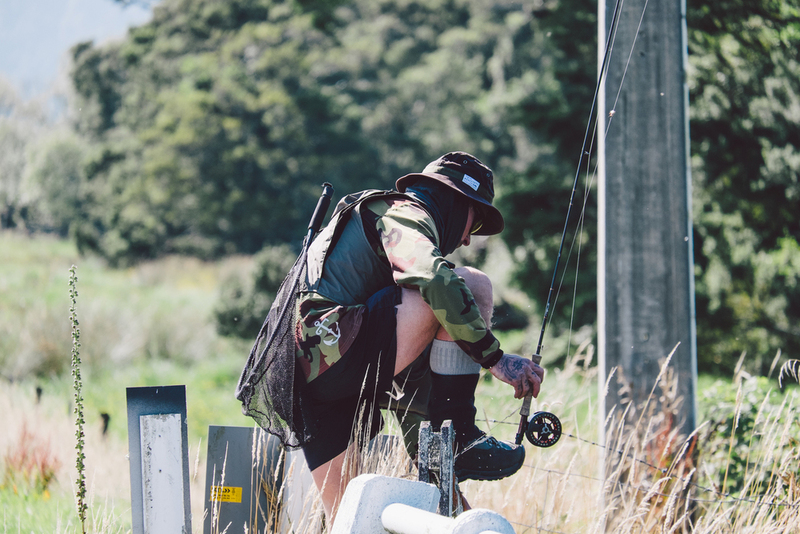 We were lucky enough to be able to get away over the weekend for a three day fly in trip to a beautiful section of the Rangitikei river to round off a pretty good season so far. 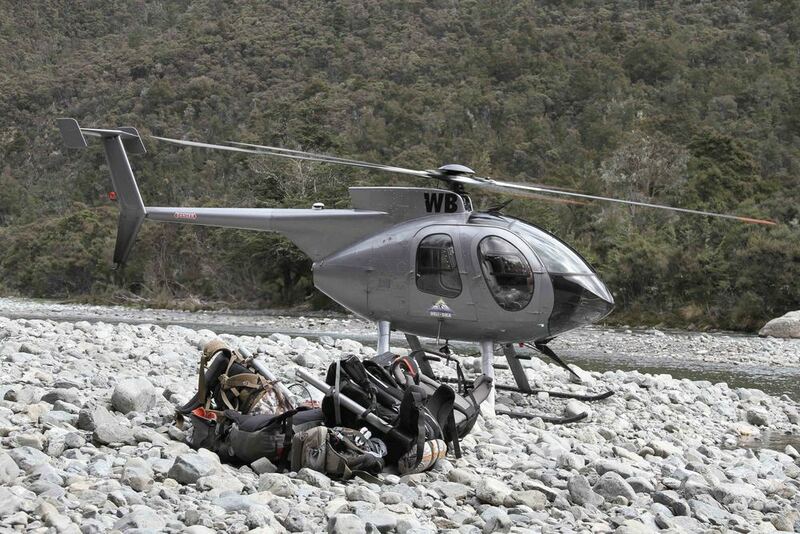 With a team of Chris from Manic Tackle project, Jakub from DTD Adventures, Sam from Moreporks and Tim ...it was set to be a pretty chilled out affair in the hills covering some ground with packs on once dropped in by Helisika and the Hughes 500. The Kaimanawas encompasses a massive expanse of native forest, shrublands and tussock grasslands, extending from Tongariro National Park in the west to the Kaweka Ranges in the east. Altitudes vary from 560 metres in the north, to the highest point Makorako at 1727 metres in the centre of the park. Kaimanawa Forest Park was gazetted in 1969 and is managed by the Department of Conservation. The south west coast bares the brunt of all the weather systems that hit New Zealand, with massive rainfall exceeding 5 meters per year. This is a recipe for deep, lush rainforest and rivers that cascade down steep valleys, frequently flooding to terrifying levels. If you manage to get hit a rare break in the weather, it's time to pack your stuff and get there. This was the case for us as we decided last minute to make the long slog up the west coast, we quickly packed and left at dawn. Unfortunately being in such a haste means things get missed, with Jakub leaving his remote control drone on the roof of his car as we took off in the morning darkness, never to be seen again. 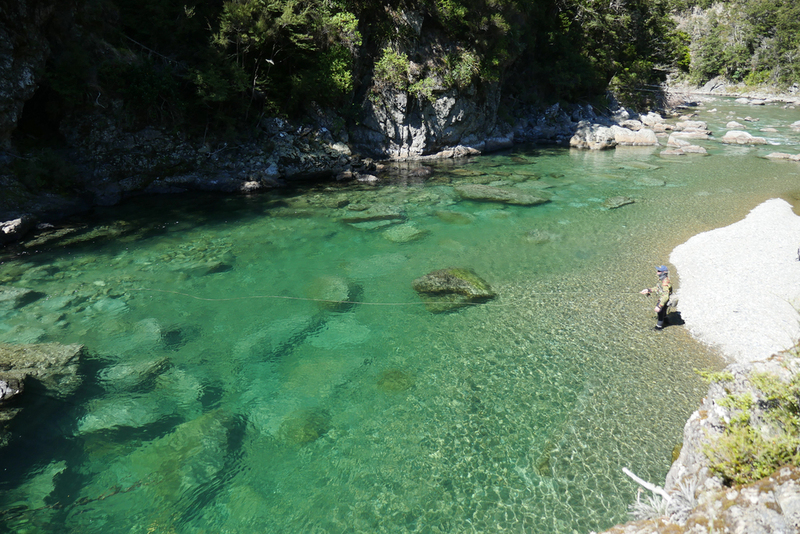 Fiordland,, the fly fishing destination that`s on every anglers wish list. It is as brutal as it is beautiful with huge canyons, fast, deep waters and swarms of sandfly that pester you all day long! The river valleys that have been carved through the magnificent peaks are home to big crystal blue waters, big boulders and fast runs. Spotting can be a challenge in even the best of conditions with huge volumes of water disguising the chrome camouflage of good conditioned fish. After many hours of driving we set up camp for the night, cracked a few beers and laid off early so we could ensure a prompt start in the morning. We travelled 3 rivers over the 2 days and came across some good sized rainbows, a few browns all willing to rise to huge terrestrial flies. The fishing was tough, but the landscape alone entices you to continue to hike up river and explore what is around the next bend. The final day saw us getting liberal with our methods in the afternoon as we made our way to the mouth of the river where fresh meets salt and can provide some surprises. As seals cruised just meters out in the bay we stripped streamers, not sure what we would find but ended coming across over 25 Spotty`s. As we made our way back to civilisation the heavens opened and waterfalls became cascading down the mountains, only to join the waters that had provided us with much joy and admiration. This is a special place and one that all should experience in a lifetime. Once again We decided to go for another trip! Matt has been fishing pretty much everyday day since the last time we saw each other, I haven't had a chance to escape this busy period at work for three long weeks. The weather looked promising for an over night trip to camp riverside and clear the mind! After a couple of hours in a truck we arrived to a strong gale, we were forced to take shelter in a deep gorge. After getting battered and bruised we decided to face the elements, we were rewarded with several decent Browns willing to rise. Day 2 saw the wind die and the sun come out for what was to be an epic day of rising Browns in gin clear water. In the 28 degree heat we both landed several healthy fish averaging 5-6lb all on dry/nymph droppers. For a section of river we had never fished before we were pleasantly surprised, the long hike in hot weather was well rewarded. Another special water chartered and one we will surely come back to visit by the end of the season, but for now it`s onto the next adventure! Dry fly double hook up galore!